An internally displaced woman seeking refuge from the ongoing violence in the swamps of Unity state, cooks her last supply of sorghum. Growing food insecurity is causing more and more South Sudanese to flee into Sudan, the United Nations refugee agency today, urging more funding for clean water, sanitation and health services, food and shelter. 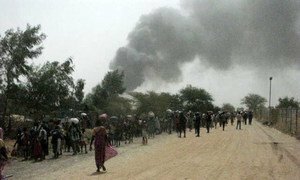 The Office of the UN High Commissioner for Refugees (UNHCR) said some 38,000 people have fled north over the border to neighbouring East and South Darfur since the end of January, particularly from the growing unrest in the north-western states of Northern Bahr El Ghazal and Warrap. The majority crossed into East Darfur, where an average of 500 South Sudanese – or 100 households – had been arriving per day rising to over 150 households last week, according to UN officials. The situation “could quickly worsen as the nutrition situation in Upper Nile, Warrap, and Northern Bahr Ghazal grows increasingly serious,” the agency said in a statement. The arrivals are reaching Sudan in poor condition, according to the Government of Sudan's Humanitarian Aid Commission. In addition to food, water and basic relief items, they need protection from sexual and gender-based violence, and many children have been separated from their families. UNHCR is working with the UN Office for the Coordination of Humanitarian Affairs (OCHA) to respond to the needs, and is also advocating for direct access to East Darfur to support the response. The UN agency has expressed concern about the 2016 South Sudan Regional Refugee Response Plan (RRRP) that covers the refugee programmes in the neighbouring countries, run by UNHCR and 39 partners. The Plan, which requires $1.3 billion is only three per cent funded. In South Darfur, over 2,000 people were registered in Beliel Camp located in the village of that name, and which has hosted internally displaced persons in Darfur. The South Sudanese coming to the camp “have faced insecurity en route” to the camp, according to UNHCR, and many are sick and in need of medical attention. These groups are part of 2.8 million people throughout South Sudan who are officially classified as facing a food insecurity crisis or emergency, according to Fewsnet, the global body mandated to monitor such situations. The food insecurity is worsened by the ongoing fighting in the country, which started in December 2013 for political reasons, and which has since forced 2.3 million people to flee their homes. While noting that the ceasefire between South Sudan’s warring factions has “largely held,” the United Nations Security Council today said it was deeply alarmed by ongoing violence in the country and set out specific steps for the parties to take towards full implementation of a seven-month–old peace deal, saying it would review their progress by the end of the month.